[INQ. NO. 1507M25] Established in 1998, Hangil Special Vehicle Co., Ltd. specializes in manufacturing custom-built trucks, industrial plants, heavy construction equipment parts, special purpose vehicles based on hydraulic and mechanical engineering. The company exported truck mounted cranes, aerial work platforms, construction equipment parts over the past six years to Russia, some Middle-East nations, Australia, etc. We have own 2 factories and all facilities to produce products in factory. It can control quality closely and manage flexible production lines from material inspection to shipment. With products offering many options, the company can supply localized, customized products to satisfy a customer’s needs. The company now operates three major business areas – truck-mounted cranes; aerial work platforms, mechanical parts. The first is used in lifting loads, heavy mass transportation in construction like general construction, civil engineering, electric works, port, logistic, mining, etc. 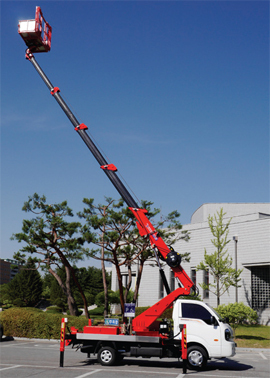 The company has various models from 1-ton lifting capacity to 20-ton lifting capacity. These ensure time-saving, reliable load handling and safe working conditions. The second is used in high place of operation with proved stability like high-rise buildings, undergoing new construction & renovations, facility maintenance, signboard & landscapes, historical property re-construction/maintenance and cinema & event filming, building management, etc. It offers from 10m working height products to 40m working height models. The third is OEM and ODM product. we supply construction equipment parts, mechanical parts based on customer’s requirements.